I love living in my 'hood on New York's Upper West Side. Since I arrived from Edinburgh on Monday afternoon I've been up and down Manhattan a couple of times. Tuesday afternoon I went by subway down to Houston Street to see "Winter's Bones" at the Angelika Film Centre; and last night the NYC Hash run was from Central Park South (59th Street) down to 14th Street via Times Square, Bryant Park, and a couple of office lobbies. I've also had two approx. 10K runs in Central Park: on my own yesterday morning, and today with Dead Runner Val. 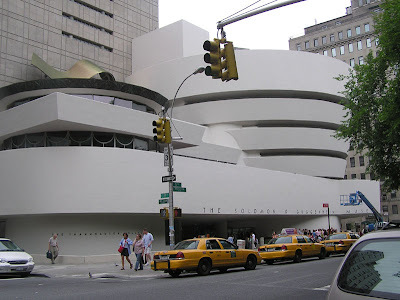 We'd arranged to meet at the Guggenheim, on the corner of 5th Avenue and 89th Street where New York Road Runners is located. I was over on the East Side earlier to catch up with my dear friend CY, who has had a very trying half-year. Great to see her looking really well and with some exciting plans. At the Hash last night I talked with Heather and Lauren from the team the Hudson Dusters, which I joined last year. I also met a couple of new people: James (English) spent 13 years in Miri, in northern Sarawak, where I met Jennie Soh and other people in June; and Julian, who is from south Florida, loves the Keys, where I'm hoping to spend a month next year. Tomorrow is the start of New York Fashion Week.